This weekend brought the annual QLD 125 State Titles at Hervey Bay. With some unpleasant weather forecast for the weekend the sailors were in for an interesting regatta. With a steady 15 knots gusting over 20 knots over the weekend, many crews put their skills to the test, sometimes coming out on top, other times they werent so lucky. Despite these conditions, all our boats went out there and gave it their best shot, developing their skills as they did. Overall, "J" skippered by Luke Johnson and crewed by Libby McNeil took out first place and well as the Jan Seto Memorial Trophy, followed by "Waterloo" in skippered by Luke Richmond and crewed by John Anderson taking out 2nd place and also 1st in the Masters, and finally "Pigs In Space Too" skippered by Christopher Mann and crewed by Fraser Hannan took out 3rd place and also 1st Place in the Junior fleet. In the handicap division our newsest recruits Jordan Howarth and Richard Strauss in "Scylla" took out 1st place, Lourdes Hill College Boat Roche Racer skippered by Jessica Muir and crewed by Jessica Biden-King took out 2nd place and finally "Nikita" aka Paws skippered by Natarsha Moloney and crewed by Megan Strauss took out 3rd place. All in all, a great weekend was had by all and was great preparation for the upcoming national championship at Humpybong Sailing Club in Queensland this December. 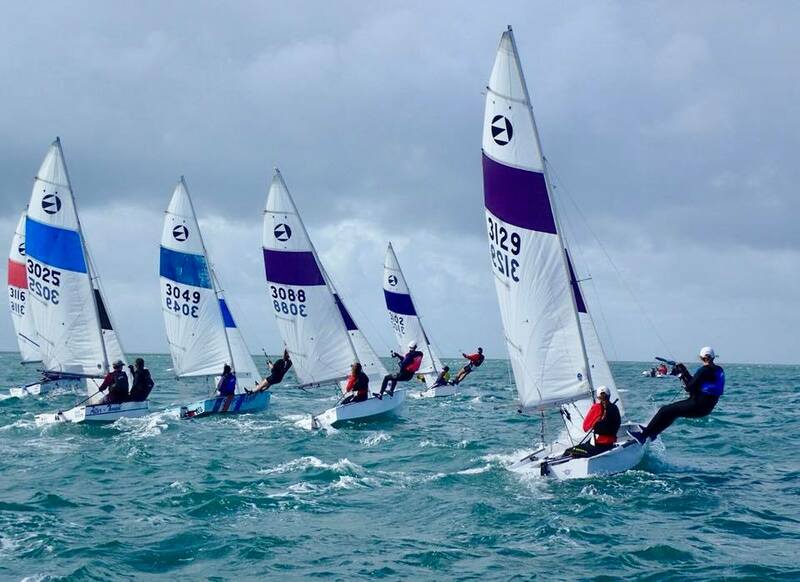 Over the Easter weekend the QLD 125 fleet converged on Hervey Bay to contest the 2013 state titles. The fleet of around 20 boats (split over two divisions) battled out one of the hardest fought, closest series, I think that we have seen. The end result hung on the result of the 5th and final race with 3 boats in with a mathematical shot at claiming the title. Let’s recap the series…. The contenders – The series this year contained the top 3 boats from the most recent National Championships at Lake Macquarie; Shake n Bake, J and Tic Tac, with Shake n Bake sailed on this occasion by the other half of the Robba sailing family. Throw in a couple of previous national and state champions on Waterloo and She Waits for No Man, and a bunch of upcoming juniors and family combinations and we knew before the first race got underway that it was going to be a great series both on and off the water. ended up sighting the mark first, allowing them to move from 5th to 2nd by the wing mark. Meanwhile J had skipped away to a small lead. Places 2-6 were all within 5 boat lengths of each other. The battling chasing pack allowed J to skip away. As the race progressed Doug and John continued to skip away making the most of their favourite conditions. The pack consisting of Tic Tac, Imagine, She Waits, Waterloo and Shake n Bake traded places over the next lap. The all-girl crews on She Waits for No Man and Imagine showed great speed and tenacity to end up crossing for 2nd and 3rd respectively. Credit must go to all sailors who battled for positions right through to the end of the marathon 3 hour long race. Tiger Lilly took race 1 on handicap, and the young crew on Blurred Image crossed first in division B. Race 2 – Day 2 saw a change in the weather conditions with the traditional Hervey Bay south-easterly making an appearance. Breeze ranged from around 8 knots up to 16 knots with some big shifts and gusts coming through. The start line on this occasion was going to be a challenge. The breeze had swung and made it impossible to cross the line on port tack. The fleet lined up gunwale to gunwale at the boat end. It was great to see a lot of the junior’s right in there fighting for position. A late shift further to the right just before the start complicated things further. J picked the approach correctly squeezing out Waterloo, Tic Tac and She Waits. She Waits ended up having to bailout, while Waterloo and Tic Tac were able to hold out just long enough to squeeze inside the start boat and follow J across the line. J continued to lead narrowly from Waterloo with Tic Tac a further 30 seconds back with Shake n Bake and Imagine just a little further back. Waterloo climbed into the lead on the final lap and was able to open up a small lead to claim victory from J and a closing Tic Tac. Lily and Xanthe in Imagine, managed to battle through to finish 4th. The win on handicap went to Tic Tac with Canada Connection taking the win over the line in division B. Race 3 – Pretty much a duplicate of race 2. A boat end favoured start again. J again got off the line in the number 1 position alongside junior crew of Meg and Delphine in Osterley. Tic Tac and Waterloo also got off the line well. Swish was the first to tack off and head towards the favoured side of the course and benefited greatly. Nicole and Simon hooked into a big right hand shift coming off the shoreline and skipped to the front of the pack to lead around the first mark, closely followed around by J, Waterloo, and Tic Tac. The front four opened up a reasonable lead as the pressure faded for the others approaching the top mark. Very little changed over the next 2 laps. Nicole and Simon continued their fantastic race to match it with the leaders, and hold on to 3rd place at the final mark. The continued pressure from Tic Tac finally was too much. Waterloo 1st from J, Tic Tac and Swish. The strong showing by Nicole & Simon on Swish got them the win on handicap with another win going to Canada Connection in division B.
Robba, jumped back on board Shake n Bake to crew for father (Mark), whilst Steve Geck filled in for Tash in Nikita who was unfortunately injured earlier in the series. Again the boat end was favoured and the bunch gathered at the boat. J was squeezed by boats to leeward and was forced to bailout and complete a couple of quick tacks just before the start. Imagine was also seen in a little tangle with another boat with a minute to go. Tic Tac on this occasion managed the boat end best and got away with speed with a nice gap to leeward. Tic Tac lead up the first work with Waterloo and Accelerando not far behind. J and Imagine after a few early dramas headed out to the left hand side but unfortunately missed locating the top mark and had to set spinnakers to come back. A couple of other boats including Waterloo also went a little beyond the mark but were able to recover. The short race seemed like it was over in around 15 minutes which didn’t allow J and Imagine to come back. Tic Tac crossed with a comfortable lead with Accelerando doing a great job to cross second, just in front of a fast finishing Waterloo. The top result by the girls in Accelerando also enough to claim the win on handicap. Nikita taking line honours in division B. Race 5 – The stage was set for a cracker of a last race; one 20 minute race to decide the podium positions. J (1,2,2,10,? ), Waterloo (5,1,1,3,?) and Tic Tac (4,3,3,1,?). The top 3 all got away well along with Osterley again right in there with a cracking start. At the first mark the result was no clearer. Waterloo rounded first, centimetres in front of J, who was centimetres in front Tic Tac, who was only 2 boat length in front of She Waits and then Shake n Bake. Tic Tac encountered an issue setting the kite and was quickly rounded up by She Waits and Shake n Bake, leaving Waterloo and J to battle it out for the lead. Great boat speed and smart sailing by Viv and Kerry in She Waits allowed them to close right up to the 2 leaders, making it a 3way battle for the race lead with Tic Tac, Shake n Bake, and Nikita 25 metres back. The front 3 boats rounded the final mark nose to tail with only a 50 metre upwind dash to decide it all. In the end J held on to claim victory and break their Hervey Bay curse, having not claimed a series together on the bay before. The win was fitting for the work these guys have put into the class over the years. On many, many occasions Doug and John have finished runners up, not only in state championships, but also with at least 4 or 5 second place finishes in national titles. They were certainly made to work for it this year, claiming the win by a mere 3 seconds from Waterloo, with She Waits for No Man a further 10 seconds behind. She Waits taking the final on handicap and Canada Connection another win in division B. This is an exciting time for 125s in QLD. We have a large number of juniors coming through, a large number of experienced 125ers making a return, and great competition throughout the fleet. With the national championships to be held in Brisbane this year we are seeing numbers increase. To assist sailors and families to get into 125s in QLD the state association has committed to assist in sourcing boats. A number of the top 125ers will also be working hard providing training and development to all sailors to raise the level of the whole fleet. I already can’t wait for next season…. The 2010 Queensland state titles held over the Easter long weekend attracted 19 entries including 7 'B' division entries. The series was colsely fought for the minor placings with 'Shake 'n' Bake', Tim and Lauren Robba, winning convincingly. A full report is available in the latest newsletter, see the news and events page. The B division attracted a record (for recent years) number of entires this year including 1 boat from NSW. Chris Taylor travelled up for the weekend and convincingly won the seires on scratch. The overall winner on Handicap was Sparkler, Max Von Richter and Jessica Eutick. Shake 'n Bake - Tim Robba & Lauren Robba are the Queensland Champions for 2008-2009 beating "J" Doug Brewer and John Anderson on a countback (both finished with 6 points). Waterloo fought it out with both of them in all races, and finished a good third. Making up for disappointing results and bad luck in the Nationals, Tim and Lauren showed some toughness and great sailing ability in taking out 3 of the 5 races in light to moderate breezes on Hervey Bay. The wind shifts were tricky to judge, as was the tide influence, so the racing was exciting. The lead changed several times in each race, and all 3 top crews had their chances. The Junior title was won handsomely by the crew of Chemically Enhanced - Oliver Burgess & Will O'Keefe. These two have improved out of sight since the nationals. They came 5th overall and won the Handicap honours as well. A very successful regatta for them - well done. The Masters title was another win for "J" - Doug & John. As they get older, they get faster. Unreal. Well done to Tim and Lauren who also took out the inaugural Jan Seto Memorial Trophy (winning Race 1 on Friday). This is a new trophy in memory of our greatest Queensland 125 stalwart who sadly passed away last year. The Timber Hull Division was won by Practical Magic - Derek Miles and Bob Sayer, from 3 other timber boats in the fleet. We look forward to more timber boats "returning to racing" in coming regattas. Our thanks to Maryborough Sailing Club for another successful regatta. See you in 2010. Handicaps carried through from the Nationals, and didn't we get some improvers. First on Handicap with only 5 points are Chemically Enhanced - Oliver Burgess & Will O'Keefe. Winning 3 of five races. Improved all regatta, and belied their nationals handicap result. Second on Handicap are Osterley - our ladies from Lourdes Hill College, Hannah Ruedinger & Ashleigh-Peta McAuliffe, winning one race on handicap and second in 3 races. Well done girls - much improved this year. Third on Handicap were our winners from 2008 - Legally Blonde, Katrina Funk and Sally Richers. They also won a race on handicap. A small 4 boat fleet in the B Division was won by local Maryborough junior crew, Maddy Norton and Emily Dahl in Hairy Canary. Their highlight no doubt was getting to the top mark in the last race in about 6th or 7th. They were pumping the air in jubilation. Look out for them next year. Second were a Lourdes Hill crew of 2 or 3, skippered by Sian Sandilands. And third was young Tom King with Dad, David King, skippering. Dave has long arms, which came in handy at times to reach the jib sheet !! From 27th to 30th Nov, nine 125’s competed in this year’s Sail Brisbane Regatta at Royal Queensland Yacht Squadron. With conditions in Brisbane being stormy and wild, hot, cool, windy and wet...it was a regatta of all wind strengths and conditions. Day one was very light....the fleet completing Heat One and Heat Two in under 12knots. Waterloo was the winner of the day..taking out both heats. Day 2 brought winds of an average 24knots and above. Blurred Image skippered by Thomas Richers showed the QLD fleet how to sail in a blow by winning Heat 4 easily. Unfortunately the young girls in Legally Blonde also from Maryborough Sailing Club suffered a blow when someone put their knee through the side of their tank in a capsize. The Queenslanders prayed for the wind to ease up come Day 3, and ease it did. Winds dropped to less than 12knots for Heat 5 and 6 and Animated Paradox sailed by Bronwyn and Nigel Seto were the Champs of the day winning both heats and looking to win the overall title. The final day arrived and everyone hit the water at 9.30am in order to complete the final three heats. The morning conditions were shifty and the lead changed at least 5 times during Heat 7, with the eventual winner being Waterloo. After numerous abandoned races and postponed starts, the afternoon sea breeze finally kicked in and Heat 8 and 9 were underway in a pleasant moderate northerly. With only points separating the top three boats, the racing was close and intense. Shake N Bake sailed by Lauren and Tim Robba were too good winning Heat 9 easily and sending a clear message about their goals for their first Australian Titles together in a few weeks. Congratulations to new State Champions, Jenny Anderson and Joanne Luscombe in Waterloo, and to all competitors in the State Titles held over Easter at Hervey Bay.